Woah! That is awesome! My "illustro Gadgets" skin pack kinda pales in comparison to what you've been able to accomplish. You're much more dedicated than I am! Anyways, do you have a GitHub repository or a forum post where I could take a look at this skin pack? I want to see if I can help with anything. Great job so far! I'm very over-pleased that you like my "tries". Sorry for responsing but now. I don't looked past in this forum for a long time. I'm not happy with all the stuff yet, but for my overclocking purpose it does enough. Some stuff is planned to be recoded and some other things I have in mind to complete. But spare time is what I don't have. That's why everything will go slowly. The thingies I've done till now were made while was reported ill and was staying at home with a bad influenza. - I don't think I'm more dedicated than you. I looked at your works and again for me: If I had done before, I would have saved me some coding- and idea-pain. You did something I was looking for!! So my tries look like they do, cause when I want some in a special way, this must be done like this. - I'll try to make a forum-thread with my rainmeter-implementaion (Gotta try, never done before). Screeners and Sources etc. So next post should have a link to another thread. And for that feel free to use any brainf#ck of my ini-files. There is a new 3.0 version of the HWiNFO plugin for Rainmeter. It is very important that you upgrade your system, and any skins you have distributed using the plugin, to the new versions of the plugin and the HWiNFOSharedMemoryViewer.exe. If you don't, there is some risk that you, or users who have your skin, will experience failure of the plugin when they upgrade to Rainmeter version 3.3, which is scheduled to be released this weekend. The new plugin can be downloaded from HWiNFO plugin for Rainmeter. Details and further examples can be found in the First post of this thread. There is no reason not to do this now, as the new version of the plugin will also work fine with earlier versions of Rainmeter. Again, you need to use both the new plugin, and the new version of HWiNFOSharedMemoryViewer.exe with your skins. You should also be sure you are on the latest 5.10 version of the HWiNFO application from http://www.hwinfo.com/. Note that in addition to just being required for Rainmeter 3.3 and later, the new version of the HWiNFO plugin also now supports monitoring sensors on other computers on your local area network. This is a huge improvement to the functionality of the application and the plugin! I think it would benefit a lot of users if you included ticking the "Show Sensors on Startup" box in the tutorial. If the sensors window is not open the skins won't work, and having them check that box would solve many questions before they are asked. Edit: Just noticed that the "minimize sensors on startup" box is ticked. If that's on do the sensors automatically start without needing to tick the Show Sensors on Startup box too? iamanai wrote: I think it would benefit a lot of users if you included ticking the "Show Sensors on Startup" box in the tutorial. If the sensors window is not open the skins won't work, and having them check that box would solve many questions before they are asked. Right. If you set it up exactly as in the image, it will work fine. The terminology in that panel is a bit strange. The sensors window will always be "started" when the app starts, that is really the only point of it. Those check boxes are for the visibility of the window when it starts. it should probably be a radio button with "start with sensors window visible" and "start with sensors window minimized". In any case, since you are almost certainly going to be starting HWiNFO with Windows, I can't see any point in showing the window at first, just have it start minimized. In HWiNFO Shared Memory Viewer everything works fine except for UPS where there is no data. 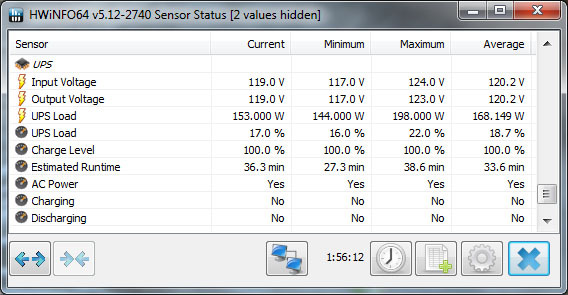 I don't understand because there is plenty of UPS sensor info in HWiNFO? Edit: A reboot fixed it. I should have tried the universal Windows solution first. Will at least the base hardware IDs (CPU [#0], GPU [#0]) be the same across computers? It got my hopes up, that I don't even have the same CPU architecture as in the example pictures, but the skin worked out of the box. Asagrim wrote: Will at least the base hardware IDs (CPU [#0], GPU [#0]) be the same across computers? It got my hopes up, that I don't even have the same CPU architecture as in the example pictures, but the skin worked out of the box. 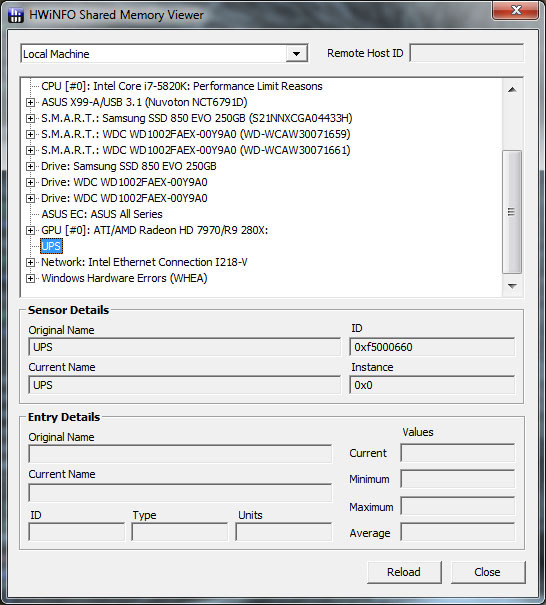 GPU #0 (the sensor and entry IDs I believe are the same but the Instance varies) is not the same across computers (some don't have a GPU!) but CPU #0 and SSD/HDD #0 (whatever C: drive is) are hardware IDs that seem to work "out-of-the-box" at least for me with the skins I've tried. Other SSDs/HDDs pretty much always require me to change the Instance ID. It is also worth pointing out that not all CPUs and GPUs have fan sensors (like the ones in my laptop). The Entry ID and Sensor ID are still the same, the sensor just doesn't exist on certain computers. For most, if not all cases, Entry ID and Sensor ID are the same. Only for CPU #0 and SSD/HDD #0 however does Instance ID consistently seem to be the same.